LAWRENCE — Jazz and flamenco have been cross-pollinating for the better part of a century. On his 1960 album Sketches of Spain, American jazz trumpeter Miles Davis explored Spanish folk traditions. In the 1970s and ’80s, flamenco guitar master Paco de Lucia collaborated with many jazz musicians, including Davis sidemen Chick Corea and John McLaughlin. Now, two University of Kansas faculty members, each an expert in one of the traditions, have collaborated on a new work that combines the two forms. “Palos Nuevos: The Jazz Flamenco Project,” a work with music by KU Jazz Studies Director Dan Gailey and dance choreographed by Dance Department Chair and Professor Michelle Heffner Hayes, will be performed for just the second time next month when a group of KU performers and instructors gives a concert April 29 at the John F. Kennedy Center for the Performing Arts. There will be a free preview of "Freedom from Fear" at 7:30 p.m. April 18 at the Lied Center of Kansas. The Kennedy Center performance is set for 3 p.m. April 29. To charge tickets by phone, call (202) 467-4600 or visit kennedy-center.org. Both “Freedom from Fear” and “Palos Nuevos” were commissioned by Reach Out Kansas Inc., a 9-year-old, Overland Park-based, nonprofit foundation dedicated to the creation of new music. Heffner Hayes said the collaboration between herself and Gailey started at a School of Music showcase concert a couple of years ago when she performed with Professor of Trumpet Steve Leisring. When Reach Out Kansas commissioned Gailey to write a new work about a year ago, he followed through on that wish. In addition to Leisring, the other soloists featured in “Palos Nuevos” are Brandon Draper, percussionist and KU music lecturer, and Beau Bledsoe, a guest guitarist from Kansas City. The KU Jazz Ensemble I, the school’s top unit with about 30 student musicians, will also perform on stage. Heffner Hayes wrote the 2009 book “Flamenco: Conflicting Histories of the Dance” and co-edited the 2015 book “Flamenco on the Global Stage: New Writings in Flamenco Dance Studies” (both via McFarland). She said flamenco follows a series of forms known as families that include related rhythmic patterns, melodies and lyrics. She said she and Gailey discussed the forms they wished to employ before he sat down to compose the music. Once he was done, he turned the music over to Heffner Hayes, and she began to work on the dance. Heffner Hayes said there are three sections of the work featuring dance, with music-only breaks in between for her to catch her breath and change costumes. “The first dance piece is aggressive,” she said, conveying emotions like fear, pride and anger. She described the second piece as more fun as she and members of the ensemble “trade fours” in the lingo of jazz, acting in call-and-response fashion. The third part is “beautiful and sad,” she said, and was inspired by Mikhail Fokine’s 1905 ballet “The Dying Swan,” as filtered through flamenco patterns. Heffner Hayes said she used the 20th century Russian prima ballerina Galina Ulanova’s performance and a version by contemporary “jookin’ ” artist Lil’ Buck as points of reference. And while Gailey’s music is written down, Heffner Hayes’ dance is only written out to a certain extent. She has made notations on the score about the action that should be taking place at various points, but mostly, she said, it’s a matter of practice, muscle memory and videotaping her performance in order to repeat the steps each time. Heffner Hayes said she hopes the next time she performs the dance will be this summer when the Jazz Ensemble travels to a festival in Italy. 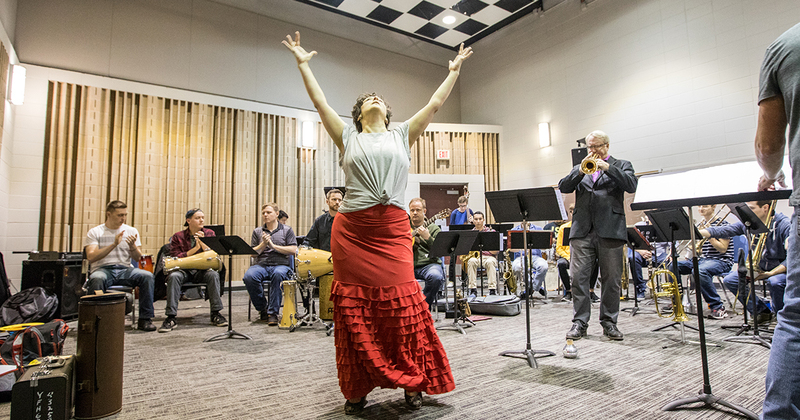 Photo: Professor Michelle Heffner Hayes practices "Palos Nuevos," accompanied by trumpeter and Music Professor Steve Leisring and members of the KU Jazz Ensemble I. Credit: Andy White, KU Marketing Communications.